Stephen Ray Franco, 26, a resident of Ketchum, Idaho, went to be with the Lord on Saturday June 2, 2012, after a tragic incident at Magic Reservoir. He is greatly missed by his friends and family. A celebration of life will be held Sunday, June 24, at 4 p.m. in the Forest Service Park, Ketchum, Idaho. Stephen was born April 20, 1986, in Sun Valley, Idaho, to Ray and Pam Franco. He grew up in Ketchum and graduated from the Silver Creek Alternative School where he was known as one who helped others. He enjoyed fishing and hunting with his dad and younger brother. 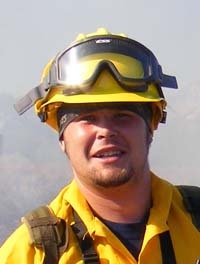 Stephen's greatest passion was as a wildland firefighter. He had recently been taken on a crew in Missoula, Mont., and was due to start this fire season. His younger brother Michael is becoming a wildland firefighter too and their dream was to be on the same fire together. Stephen was known as a protector of the weak, a hard worker, a man with a rich sense of humor, incredibly loyal, kind, funny, strong and optimistic. He touched many lives with his loving heart. His mischievous grin lit up any room. He had friends from many walks of life. He was big in both body and heart and did everything to the fullest. He is survived by his parents, Ray and Pam Franco; his brothers, Joshua Walker and Michael Franco; and his fiancee, April Williamson. In lieu of flowers, please send donations to the Wildland Firefighter Foundation, 2049 Airport Way, Boise ID 83705 or April Williamsom, c/o Pamela Franco, US Bank Ketchum Branch. Thank you to everyone for your love, prayers, support, gifts and encouraging words. This community has been amazing to us. Stephen Franco: always a kid and always in our hearts.